Don't rely on the weatherman to plan your time on the water. Our waterproof/breathable Huk Packable Rain Jacket is wind proof and is light enough to pack into its own bag to stow almost anywhere just in case. The 3-piece draw cord hood has additional fit customization through rear tab Velcro. Taped seams, Velcro cuffs, draw cord hem give that extra assist to keep the rain out. Don&apos;t rely on the weatherman to plan your time on the water. 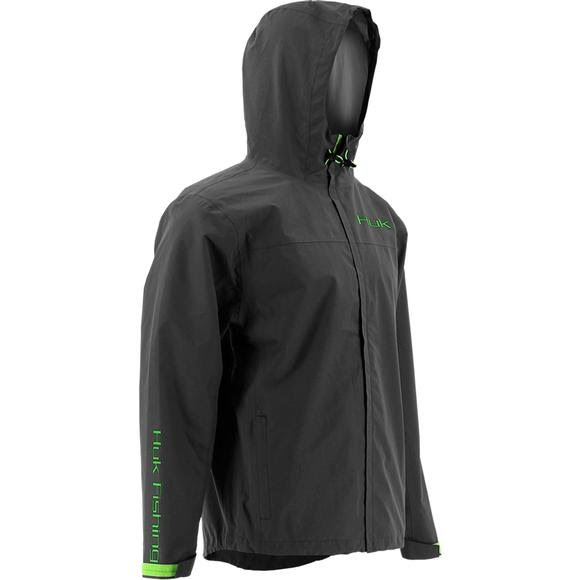 Our waterproof/breathable Huk Packable Rain Jacket is wind proof and is light enough to pack into its own bag to stow almost anywhere just in case. The 3-piece draw cord hood has additional fit customization through rear tab Velcro. Taped seams, Velcro cuffs, draw cord hem give that extra assist to keep the rain out. Underarm zip vents let the additional humidity out when needed. We even put a little picture of the jacket on the packable bag so you don&apos;t have to guess what you&apos;re unfurling when that storm rolls in. This jacket is ideal companion when Mother Nature and the weatherman disagree. Don&apos;t worry, it may be light and compact, but it punches far above its weight class.